Welcome to a home of neutrals and pleasant surprises at every turn. 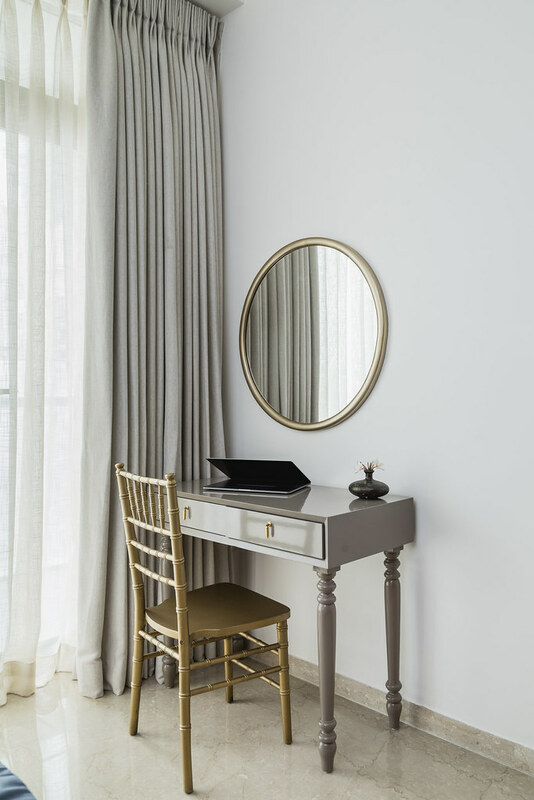 A healthy marriage of warm neutrals and controlled splashes of quirkiness and color. 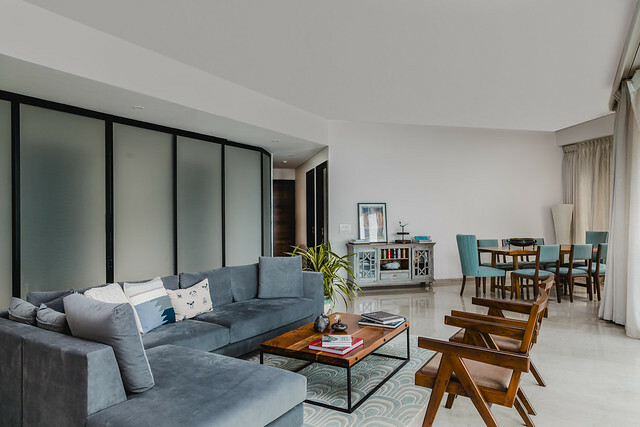 An expat calls this sprawling apartment in Mumbai his home. Designed by SwitchOver Studio, it is contemporary and minimalism at its best. 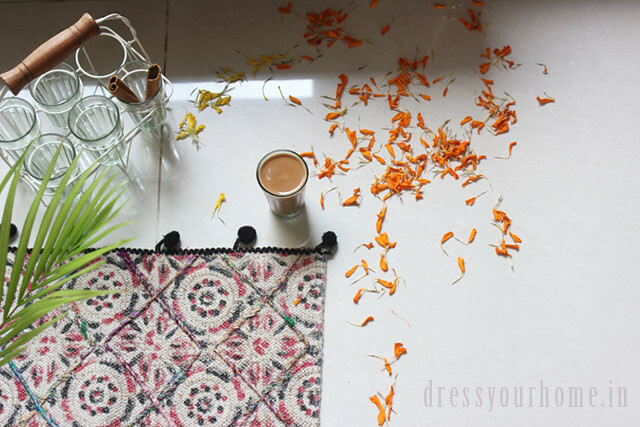 There is nothing that stands out at first until you take a closer look for the Indian touch in accessories and furniture. Boy, did it surprise me to so much of Raj Kapoor? Yes, that’s the unexpected element in this house. Read on to pleasantly discover how and where. Also, watch out for all those refurbished thrift finds. Occupant(s): an expat from Switzerland with his wife and daughter visiting often. Aesthetic: Modern, contemporary with minimal Indian bohemian touches. A neutral color palette with the warmth of natural wood. 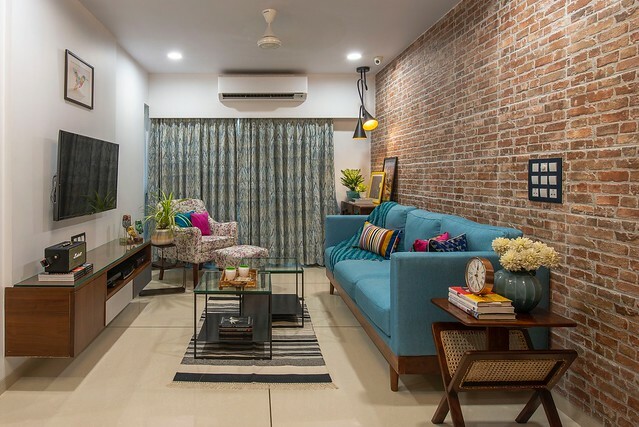 Considering he was staying alone in Mumbai for most part of the year, he wanted a healthy mix of homely feeling (for comfort) with a slight Indian touch. The more we discussed with him, the more we got to know of his taste. Subtle shades and natural rustic wood were some of them. He was open to a lot of ideas. The fabrics, shades and textures are a result of our discussions. The main lighting of the house was provided by the builder and was very dimly lit. Considering the client didn’t intend on staying there for long we decided to play with lose lighting such as floor lamps and table lamps. All the furniture in the house has been customized based on the size and finish material unless as mentioned. 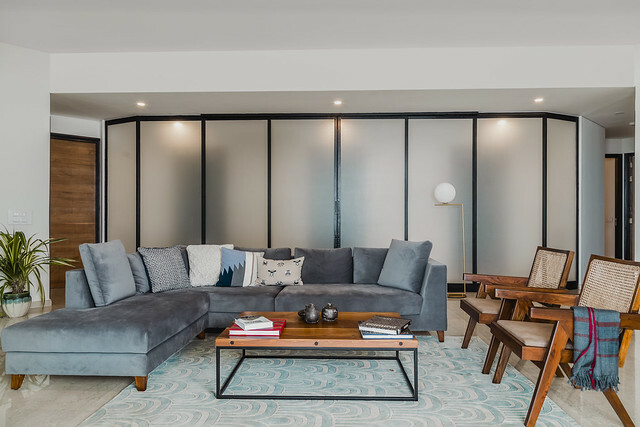 The main living space is largely covered by a floor to ceiling glass partition for security access. The client has planned on getting his Enfield and placing it right in front of this. 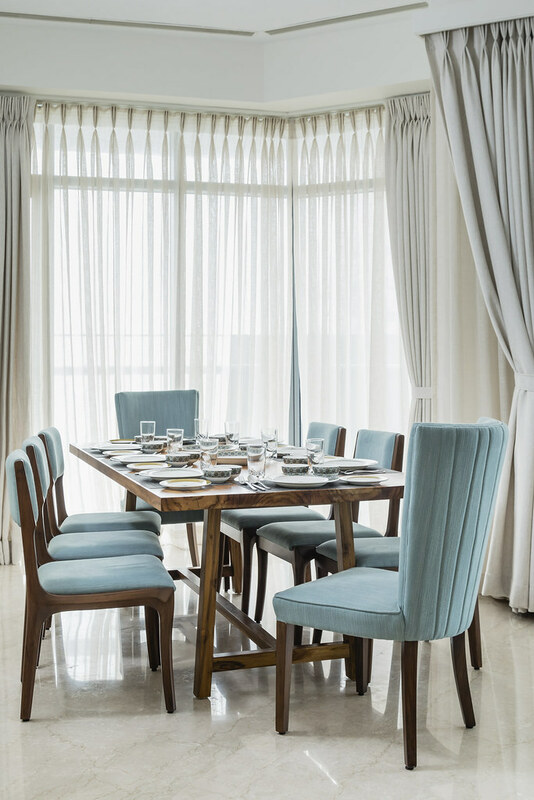 One side of the living room features the hardwood natural finish dining table with pastel aqua finish customized dining chairs. In the center is the main living seating consisting of a L-shaped sofa and two wooden chairs. It’s inspired by a Swiss architect Pierre Jeanneret who modeled it after The Chandigarh chair from the 1950s. The center table has been designed to complement the dining table. The massive curtains in off-white serves as a beautiful backdrop tying all the elements of the living + dining rendering it a cohesive, warm look and feel. 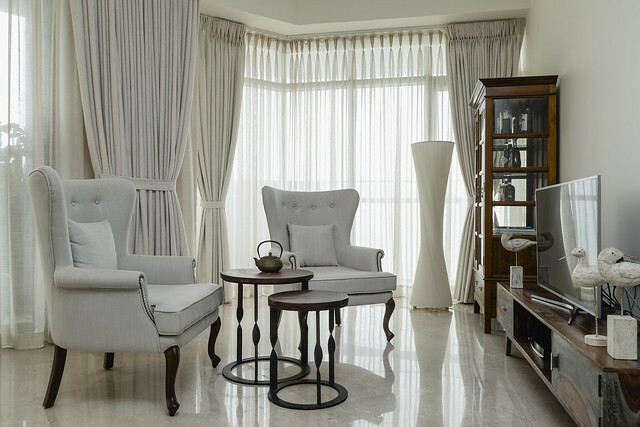 The entertainment area comprises two winged arm chairs with a small set of tables bought from Chor Bazaar. In the corner a refurbished bar cabinet from Chor bazaar. The credenza in the corner along with the accessories were procured from local chor bazaar. 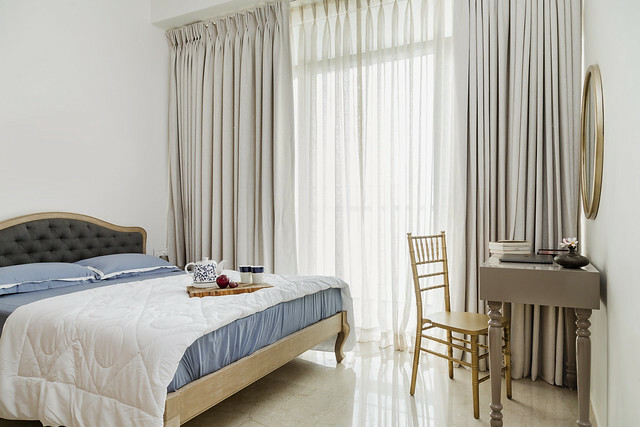 The master bedroom’s simple colour palette makes for a wonderfully calming intimate space. 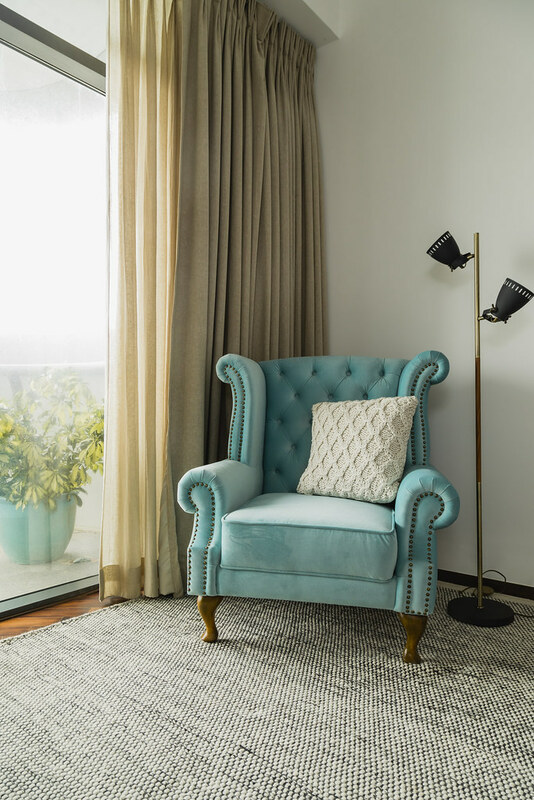 The sky blue wing chair from Pepperfry with a classic gold floor lamp and the jute look-like yet really soft carpet has been unusually paired with dusky brown wooden flooring. 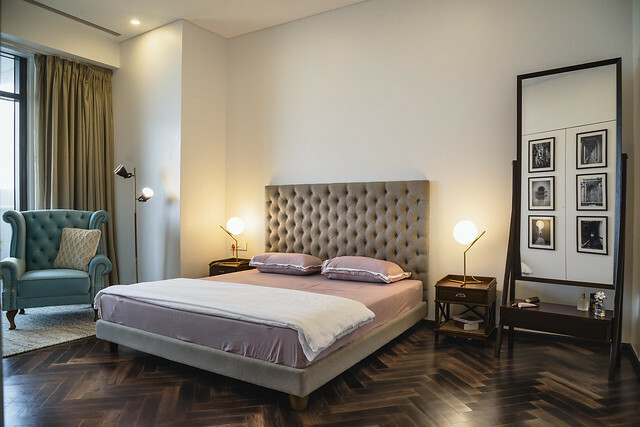 The upholstered bed was customized with a tufted headboard to give it a luxurious feel. The dark brown veneer finish table was customized with brass finish modern straight cut finish legs. 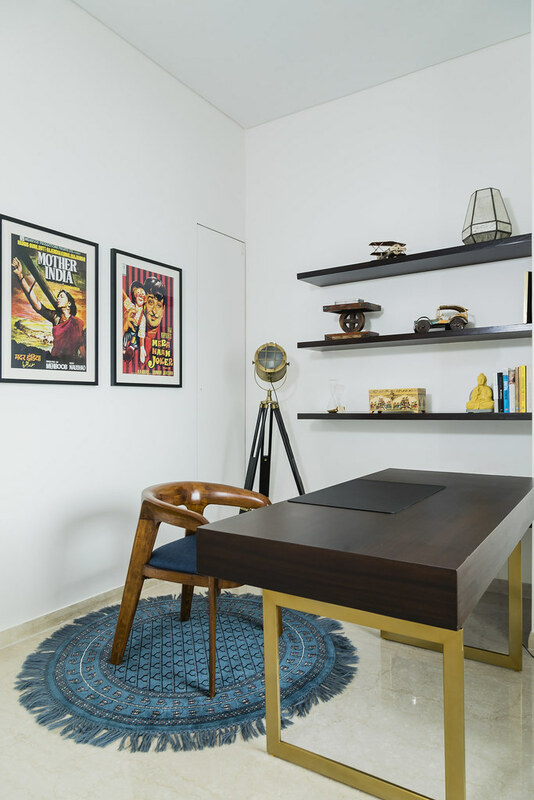 The chair is a refurbished piece from Chor Bazaar, and a welcoming change to the office chairs one is used to sitting on all day. Now, we unveil the surprise element of this house – slick Bollywood posters of classics from the ’60’s. It serves as a perfect, kitschy Indian backdrop when the client is on video calls.